At a towering 5ft, 5 it’s an incredibly rare occurrence for me to ever get the one up on someone in the height department, let alone an entire town. This week, the almost sadomasochistic pleasure to loom over a Lloyds Bank, a post office, and even a four star hotel, became a dizzying reality when I visited a 50s replica model town village. My entry into the charming local attraction was vivacious; as if I had just been offered refuge inside the warm vaginal embrace of Caterina Murino’s love cocoon. I was keen to immerse myself into the world of tiny buildings, coupled with mini lakes and midget dollhouse people. In the past, my experience of miniaturised worlds came to an abrupt halt after visiting the penny-pinching “Lego Land” resort, where the price of a single ticket could cover half the Eurozone deficit. Upon entry you’d stumble around the over priced gift shops for half an hour, before unearthing a Lego model of central London that you’re only allowed to gawp at from a distance. After paying the much more reasonable £6 entry charge I was greeted with my very own micro utopia, and I was its giant Prophet Mohammed. However unlike the Prophet, I wasn’t going to burn down buildings, behead Jews, and marry the local 6yr old. I was going to play gentle giant, and tip toe up the tiny streets peering into the windows at the dollhouse goings-on. In one room, they were cooking dinner, in another the doll figurines were applying for bank loans. On the charm-o-meter, this measured into the ‘right bleedin” as you looked lovingly down at the shop fronts, complete with tiny sausages, Kit-Kats, and miniature trousers. To think at any moment in my wood-laden concrete empire, I could’ve dropped my trousers, and inserted myself through the window of Miss Maple’s bakery, giving her a double-barrelled facial that on this scale would be like being jet blasted by a creamy riot cannon. It would bear the sort of power normally used to disperse crowds of aggressive liberals, and would be a blast so intense, that the homemade bread, the pots and pans, and even the dining room chair would be up the duff. A continued walk along the miniature train set complete with stations and conductors further added to the quirky nuances of the model village. Everyone else there was over 60, in boiler suits, and loved to talk about coal. Conversation with them was polite and engaging, as they tell of how the world has changed so drastically and in such a short space of time. Their knowledge on rail travel was vast and commendable too, as was their insight on free-range milk. As the day drew to a close, I knew I would soon have to return to the status of Hapless Tiny Tim in the big world again, and so took one last enjoyable moment of grandeur. 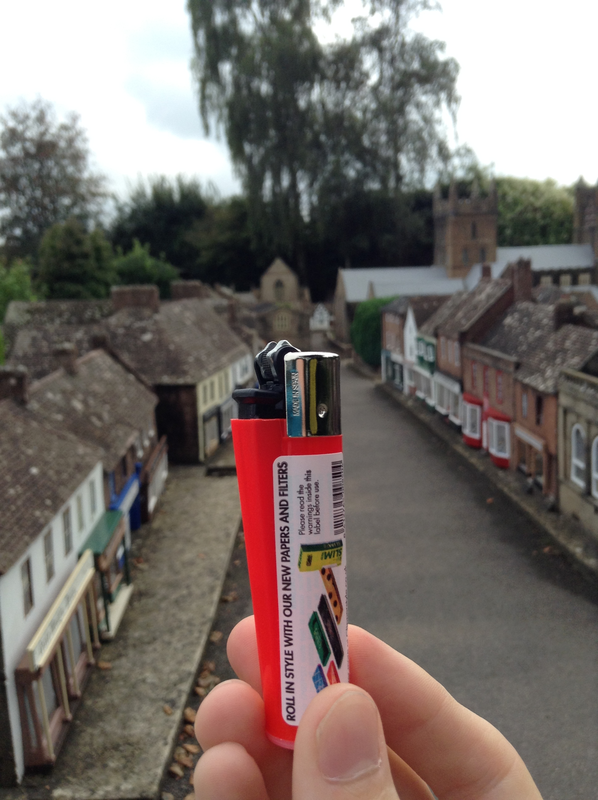 I bought my lighter at the gift shop, as fellow visitors regaled in classic ventures now confined to history; the original Werther’s Originals, the Pie and Eel shop, boiled sweets, and cheap tobacco.